Saint Nicholas - an ancestor of Santa Claus ? Every year around mid November, Saint Nicholas, or as we say here Sinterklaas, makes his arrival in most towns of Holland and Belgium. 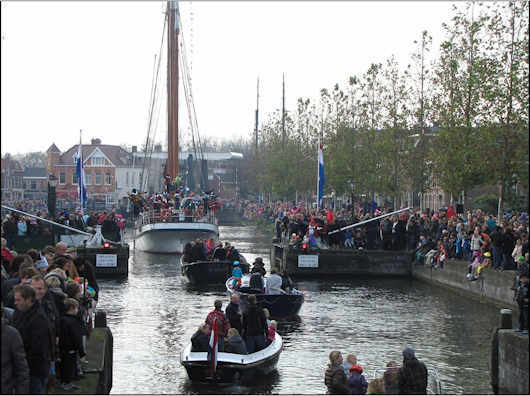 That's always a big happening, also in the small town of Weesp. During the nights till December 6 (his birthday), the saint will ride over the rooftops on his horse. Assisted by a legion of "Zwarte Pieten" (traditionally Black Petes although they come in many colours nowadays), he'll drop presents through the chimney for the children. That is, if they have been good. And if they sang a couple of songs in his honour at the fireplace, before going to bed. Also, a shoe must be prepared with a carrot for the horse. The climax is the evening of December 5. "Pakjesavond", presents evening. Then it's not for the children only. In the family, everybody gets a specially prepared present. With poems, mostly of a satirical nature. Making fun of the receiver. This (main) present is packed in a so called "surprise" : a home made object that contains the present. Can be huge, can give you an idea of what's inside, or just the opposite. Generally hard to unpack, a "surprise" can take weeks to make. One of the curious things about this extremely popular festive day is that Saint Nicholas is of course a catholic bishop. As Holland is formally protestant, and fought a bitter 80-years war of independence (1568-1648) against catholic Spain, you can imagine that the authorities were absolutely not charmed by this yearly happening. So, certainly in the 17th and 18th century, they went through a great deal of trouble to get rid of this tradition. Without success, obviously. The painting below by Jan Steen (made 1665-68) shows that basically not much has changed in the way we celebrate Sinterklaas. Well yes, it is of course very much commercially exploited today. But in our family, we keep it simple. On the painting you see "speculaas", typical Sinterklaas-cake, sort of gingerbread. Mid November is the time for me to start baking them again. Fortunately to the delight of the family ! A recipe of this traditional treat on Coquinaria. 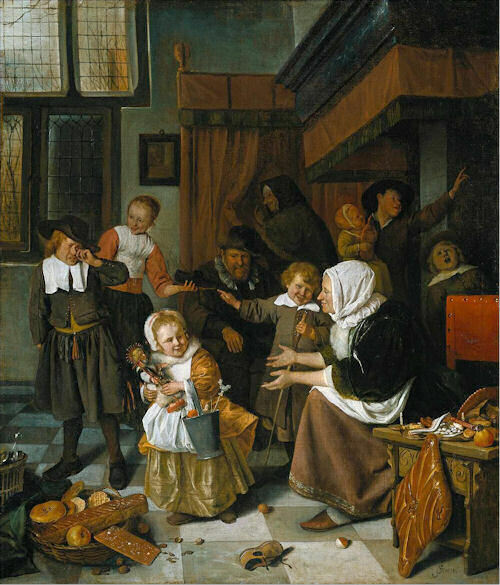 In this "St Nicholas Feast", Jan Steen supposedly portrayed family members. The little girl, who is clearly happy with her present and a bucket full of goodies, could then be his daughter Catharina. The weeping boy, who found the whip in his shoe, his son Thadeus. For enlargements, details and backgrounds, follow this link to the Rijksmuseum in Amsterdam, where the painting is on display. More general information, see St Nicholas on WikiPedia.